We’ll often have friends join us for the weekend at our home in Maine (especially during the summer – I wonder why that is?) and it’s ever so helpful to have food to hand that doesn’t require you to spend the whole weekend in the kitchen.When we’re expecting guests, I like to make quiche ahead of time. Confession, I used to have somewhat of an aversion to quiche. At university I dated a guy who shared that his sole ambition in life was to live within walking distance of the Stockport Country soccer club and to spend Saturday evenings at home eating quiche and salad. Needless to say, we didn’t date for much longer after that. Luckily, I’m now over my fear of quiche and it’s on my go-to list when we have a house full of friends. One or two quiches can be baked, wrapped and left in the fridge so your friends can help themselves to a slice whenever they feel hungry. 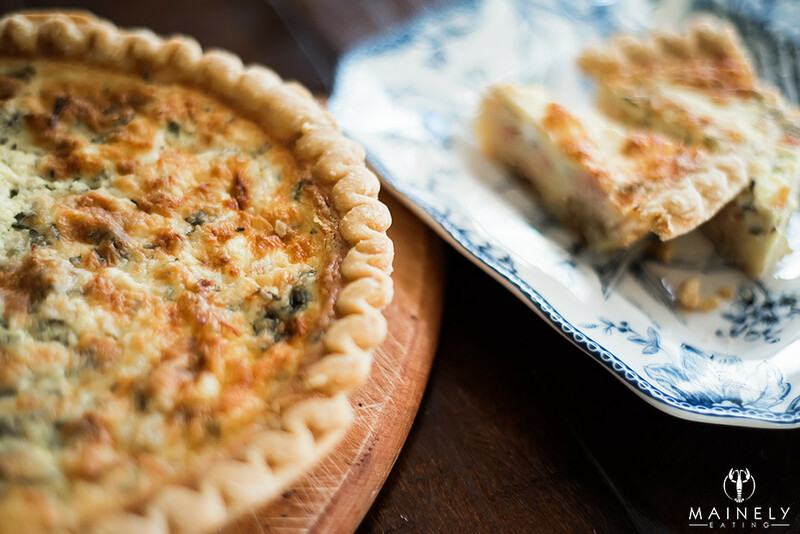 Quiche works at room temperature for breakfast or served warm with a crisp green salad at lunch. Start with the caramelized onions as they take the longest time. Over a low heat, cook the finely sliced onions in a little butter and olive oil with salt and pepper. Don’t rush this. You want the onions to really caramelize vs. char so expect them to cook for a good 60-90 minutes. 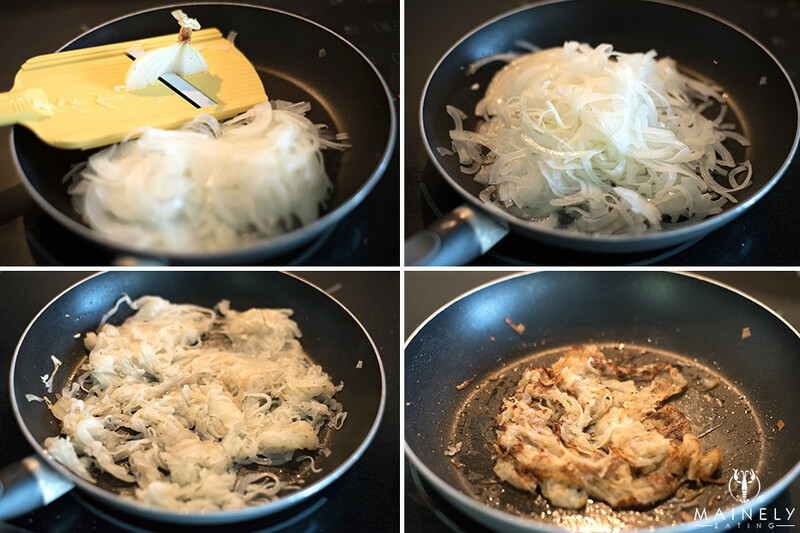 The fluffy white pile of onion ribbons will reduce down to a sad looking tangle but will taste oh-so-good. Pop a store-bought (defrosted if frozen) pie crust into a 350 degree oven for 10 minutes, you’re just looking to partially cook it. Ideally you’ll “blind bake” it (put a piece of parchment paper in the base and weigh it down with beans or rice to stop the dough from rising up) or if you’re lazy just poke it a few times with a fork. Mix the 3 whole eggs, 2 egg yolks, heavy cream, mascapone and chives. Season liberally. Add the caramelized onions to the bottom of the partially cooked pastry case. Top with half of the grated gruyere cheese. Follow with a layer of chopped ham. Pour over the egg/cream/mascapone mixture. It helps to poke a fork around as you add the egg mixture, this ensures the mixture sinks all the way to the bottom (through the cheese, ham and onion layers) and there are no hidden air pockets. 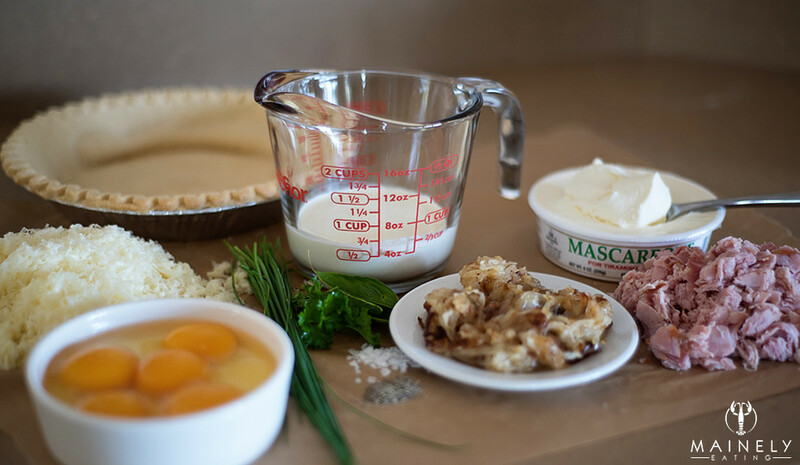 Don’t overfill as the eggs will rise up a little during baking and you don’t want your quiche to overflow. Lower the oven to 325 degrees F and bake for ~40-60 minutes (use a skewer/cake test/toothpick to check the interior isn’t still super runny). If the edges of the pastry are getting too brown/burned halfway through cooking then wrap them in a little aluminum collar (top right picture). You want a tiny tiny bit of wiggle/jiggle when you shake the quiche as it’ll keep cooking once you remove it from the oven. The exact cooking time will depend on your oven, it takes ~40 minutes at our home in Maine but closer to an hour at my Mom’s house. And here are pictures – look at those sad onions, but they’re so delicious! I used to have one of those complicated-to-set-up Japanese style mandolines but it was a pain to deal with. I bought one of these nifty little mandolines recently (image on left) and I love it (click on the image to buy through Amazon affiliate link). Great for onions, wafer thin slices of cucumber for salads, zucchini and more. 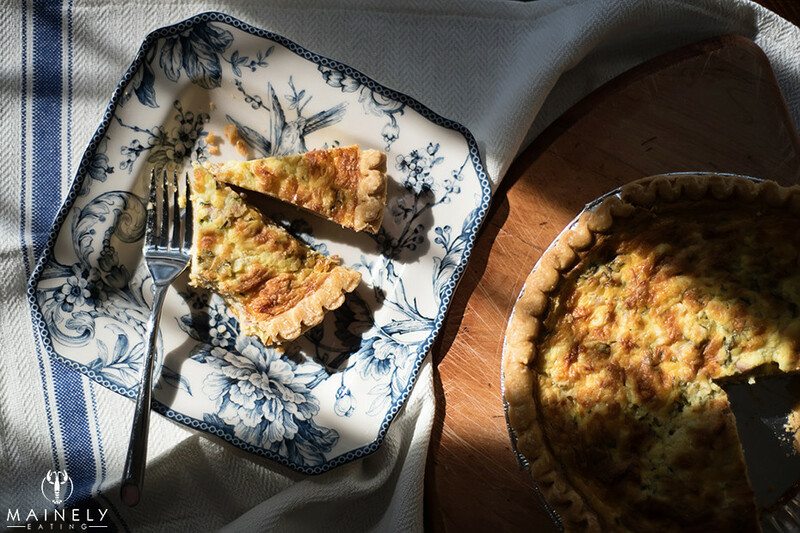 This entry was posted in Breakfast, Brunch, Entertaining, Home cooking, Lunch, Make Ahead and tagged Quiche recipe by Mainely Eating. Bookmark the permalink.